Twitter is down more than 5% Tuesday after Citron Research tweeted that it is the most vulnerable social media company to privacy regulation. Social media stocks have been under pressure amid fears of more regulation after it was discovered last week that Cambridge Analytica accessed the data of 50 million Facebook users without their permission. Twitter pushes back against Citron’s claims. Twitter shares are down more than 5% Tuesday after Citron Research tweeted it’s the social media company “most vulnerable to privacy regulation.” Twitter was down roughly 2.5% ahead of the tweet, and has since doubled its losses. 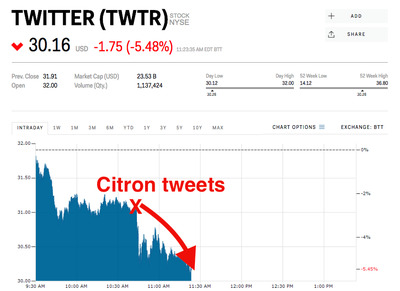 “Citron short $TWTR,“ the firm tweeted Tuesday morning. “Near-Term target $US25 Of all social media, they are most vulnerable to privacy regulation Wait until Senate finds out what Citron has published.” The firm said in an accompanying note that it had sold its long position in Twitter, and is now taking a short position. Citron’s warning comes a little over a week after it was discovered that Cambridge Analytica accessed the data of 50 million Facebook users without their permission. That news sent social media stocks into a tailspin amid concerns of more government regulation. Advertising revenue actually shrunk for 2017, while data licensing revenue grew.”In 2017, ad revenue declined to $US2.11 billion from $US2.25 billion in the prior year while data licensing revenue grew to $US333 million from $US282 million in the prior year,” Citron said. A Twitter spokesperson said the company doesn’t sell data pulled from direct messages. “Twitter is public by its nature,” the spokesperson said. Twitter shares are down 14% over the past week, but up almost 24% this year.